Aside from the absolute everyday essentials such as a phone, your keys, and wallet, there is another indispensable item that adds convenience to your everyday life – a fantastic pocket knife. It is useful for opening packages, carving food when you need to, cutting cord or rope or protecting you against an assailant in case such an incident takes place. When you choose an EDC (everyday carry) knife, you should make sure that it is slim enough to carry without being inconvenient but still be functional and accessible. You need to pick ones that you can carry comfortably and still remain prepared for just about anything. Of course, the area you live in plays a role in the legality of a knife, so when you say “everyday carry,” it specifically means short utility blades and folding knives—not large hunting or camping knives. You could call it a tool, a friend, or whatever you like, but a powerful pocket knife is a terrific thing to have with you at all times. When it comes to choosing one, it is all about what you need, prefer, and how comfortable it feels in your hand. Here is a comparison chart of what we consider the best EDC pocket knives so you can choose the right one for your needs. This is an EDC knife that comes with an AXIS locking mechanism and an ambidextrous thumb-hole opener or thumb-stud. It is 154cm long with a stainless steel blade that gives you a quality blade for all cutting tasks. 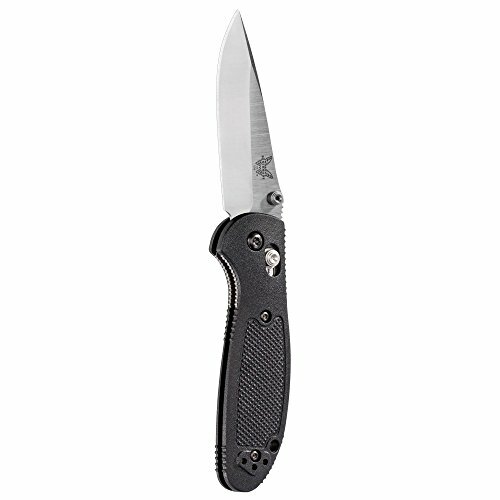 The Mini Griptilian has a glass-filled nylon handle material that has stainless steel liners as well as a reversible tip-up pocket clip. It is comfortable to use and made with the finest quality materials, ensuring sturdiness and durability. One of the things that we like about the Mini Griptilian is its handle, which is designed to ensure comfort while you are holding it. We think it is a great tool to have for general everyday use. We also like the fact that it is a perfectly-balanced EDC knife. It is also the right size for your pocket. 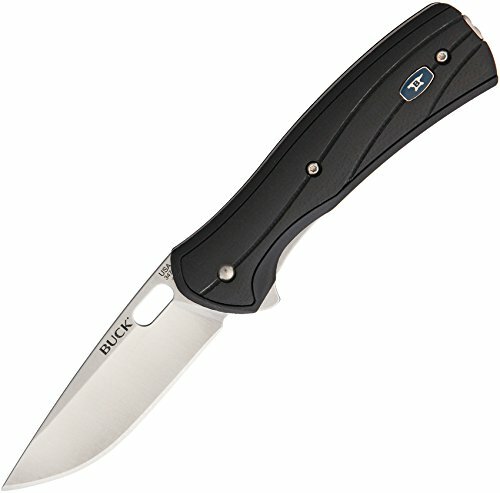 Customers who have bought this knife recommend buying two, it’s a well-made knife under $100, a great pick if you ask us. The design of the knife is not meant for tactical use. Since it is a large knife, it should also have a tip-down option. The Onion Blur is another fantastic EDC knife that is a must-have. It comes with a quality handle with DLC coating and a reversible or removable pocket clip. The handle is anodized aluminum with Trac-Tec inserts. This folding knife features a Speed Safe design that is useful when you are opening it. The Speed Safe feature has a torsion bar that helps in keeping the knife closed and prevents it from being opened by accident. It comes with 3 3/8-inch Sandvik 14C28N steel blade with Tungsten DLC black coating. The Onion Blur is great for everyday carry. 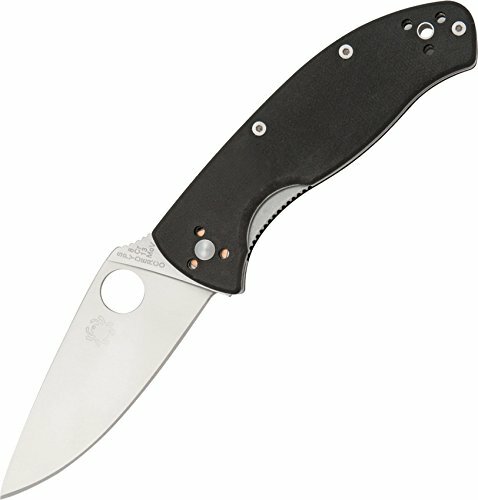 This is definitely a model you should consider if you are looking for an outstanding EDC knife. We consider the Onion Blur a really good pocket knife to have, one worth checking out if you are considering picking a well-built knife from a renowned maker like Kershaw at a very affordable sticker price. We like its fine quality steel and its superb design for just a little over $59. It also gives a comfortable grip which is important in any EDC knife. This knife has a great blade for its price that cuts easily and has an excellent strength. Apart from the grip, it also feels comfortable in the hand as it is the perfect size. A salient option at a reasonable price, if you don’t want to break the bank to get a quality knife, you should keep the Onion Blur as one of your options to consider. It would be nice if the handle is a little more contoured for easier actuation. Since the lanyard hole seems superfluous, it may be an astute idea to do away with it. The Endura4 is an EDC knife that is made with great quality materials. It is tested for durability and quality. It comes with a screw-together construction and 4-way clip. It has skeletonized steel internal liners which make the stronger without adding weight, and phosphor bronze washers to smoothen the open/close action. Bi-Directional Texturing is molded onto the handle’s surface so that you get slip-free tactile traction. The Endura4 is a great-looking, well-designed EDC knife that you should definitely consider if you are in the market for one. We believe that the Endura4 delivers excellent quality as well as engineering. the grip of this knife is secure and comfortable, not to mention durable. It works well for food and also for outdoor tasks. It is lightweight, which makes it very comfortable to use. We also like the fact that it is easy to conceal and works fine for heavy-duty tasks. Many say that it is the knife they carry around everywhere as it has poignant features that not many other EDC knives have. The position of the pivot should change as it is too far back. Also, the knife does not sharpen easily and hence, something should be done to alter that. The Vantage Pro is a well-designed folding knife that is perfect for all types of tasks. It comes with a really good blade for its price. It has a high ductility and superb edge retention combined with corrosion resistance. It also has a smooth one-hand opening and a stainless steel liner lock that allows you to lock it open. It comes built with two liners made of quality stainless steel for extra safety and durability. The Buck Vantage Pro also has a thermoplastic handle that ensures a comfortable and secure grip. It comes with a deep pocket, reversible, tip-up clip so that you can carry it discreetly. We give the Vantage Pro high praise as a great EDC knife for its price. First, we like its ergonomic grip that makes it comfortable to handle while doing tasks. It also fits the hand well, which is something all EDC knife users look for. We also like that it is very sharp and can be used for a variety of cutting jobs. It is also durable thanks to its fine quality. We really like the blade which is made of a very durable stainless steel. The knife is held together with pins and not Torx screws which do not allow the user to take the knife apart. The thumb is too small but you can still open the knife one-handed. 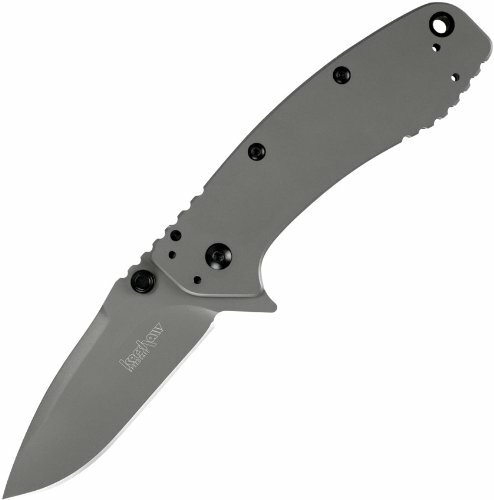 The Ontario Rat II is a fantastic folding knife that is made with Aus-8 stainless steel and comes with a nylon handle that has an open-built steel liner lock frame. It is designed to be compact and lightweight, measuring 4.1 inches when it is closed and 7 inches open. It has a 3-inch satin finish, full-flat taper, plain edge grind blade which is judicious for all types of cutting tasks. The Rat II is designed for performance and comfort. It also features an ambidextrous construction with dual thumb studs and a 4-way reversible pocket clip. It is definitely a great option to have as your folding EDC knife of choice. This knife has excellent fit and finish, especially for the price it comes at. We like its smooth open action and that it locks open and closes securely with a solid click. 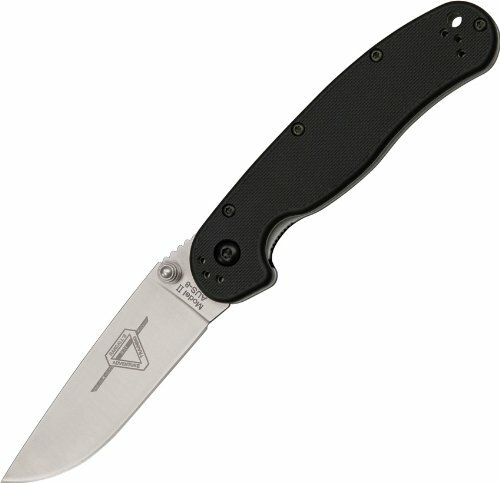 The Ontario Rat II delivers a very good workmanship and quality. We think is a good option if you are looking for a wonderful daily use knife with a blade size that is small enough to conceal. It is easy to maintain and works excellently for everything, from cooking to wilderness tasks. When you have it in your hands it feels pleasant and well balanced. It should have a deep pocket clip. Also, the lock-up material should be of better quality. 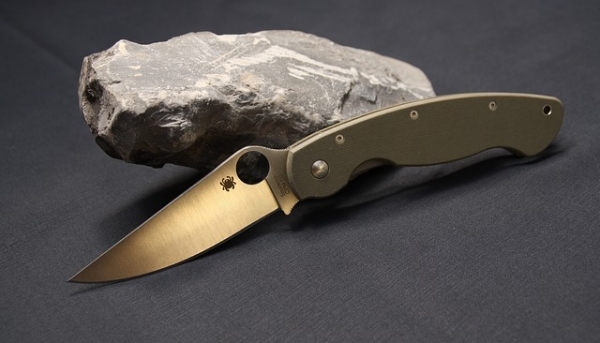 The Tenacious is another excellent offering from Spyderco when it comes to folding EDC knives. It has a black G-10 laminate handle to give you fatigue-free and comfortable cutting. The Tenacious has skeletonized steel liners inside which increase the handle’s strength and rigidity without adding useless weight or bulky thickness. The shape of the stainless steel is slip-proof and ground-flat from the spine to the edge to give you a fine cutting performance. The Tenacious is a well-designed knife that works excellently for all tasks and is definitely a good pocket knife for every day carry. The Tenacious is surely a great option at a really affordable price, one of the reasons why is included in our top ten list. We like how it feels in the hand and the firm grip. We think it is a high-quality knife that is perfect for everyday carry. The blade thickness is another feature we really like about this knife as it is strong enough even for heavy duty tasks without being bulky. A nice feature of this knife is the fact that you can switch the pocket clip around to suit your preference. It feels solid due to the skeletonized steel liners and the strong liner lock. We firmly believe this knife is a great value for the money and we recommend it to anyone looking for a top quality pocket knife for EDC. The knife has an amazing craftsmanship, but it would help to change the tip-down default clip position a little bit. Also, it would be fantastic if the steel blade is as hard as other knives. 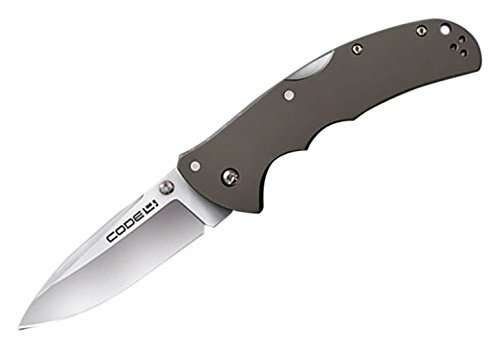 If you are looking for a well-made, quality EDC knife, the Code 4 is another good option to keep in mind. It performs perfectly and is made of the finest materials available for its price range. It is lightweight, very thin and highly functional. It is a very comfortable knife to hold. The Code 4 comes with an ambidextrous pocket clip and thumb studs. It features hard-anodized aluminum handles that are sturdy and strong, exclusive tri-ad lock as well as razor-sharp alloy blades. For a knife that is comfortable to use, performs well and looks great, the Code 4 is an excellent option to have as your EDC knife. The Code 4 is a cool pocket knife to have. We like the superb quality and the great materials it is made with. We also like the design as it is lightweight, compact and allows users to carry it discreetly. Another great thing about this knife is its full-grip handle which feels really good in the hand and its solid finish not to mention the beautiful razor-sharp blade which is thin yet extremely durable. We like the light lockup as well. 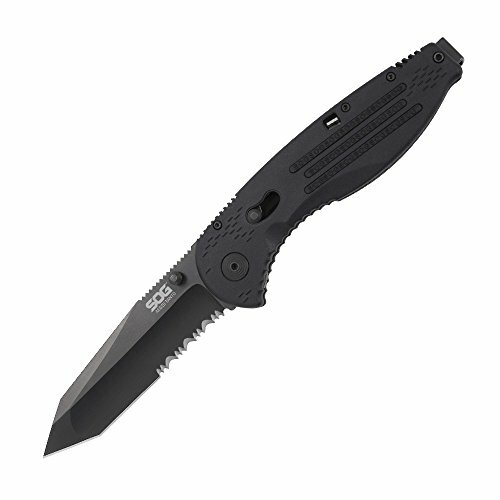 Taking into account all the great features this knife has and its price, we believe it gives awesome value for your money. That’s why we think the Code 4 ticks all the boxes on the list of things you should look for in an EDC knife. The pocket clip can be made looser to remove the knife in an emergency. The lock back should also be made easier so that a physically weaker person can unlock it with ease. The Cryo II is a well-designed EDC knife that comes with a flipper that you can use to manually open it or for assisted opening too. It allows you to move the blade out of the handle with ease. The Speed Safe feature is useful when opening the knife with one hand. It also has a deep-carry clip which allows it to fit comfortably deep in your pocket. With a classic Rick Hinderer design, this EDC knife is made of pure stainless steel with titanium carbo-nitride coating. 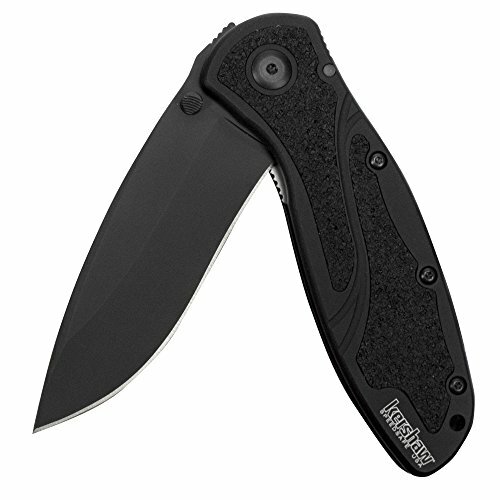 The Kershaw Cryo II looks nice, it is sturdy and feels good in the hand – everything you need in a pocket knife. When it comes to EDC knives, this is an excellent option to have in mind thanks to its features and unbeatable price for its category. We believe that Kershaw did a great job designing the Cryo II making it perfect for those looking for a high quality, affordable EDC knife. We like the frame-lock system that makes it highly solid and also the opening assist. We like a lot how comfortable it is to carry and use. It performs well in both light and heavy duty tasks. It fits well in the hand, making it comfortable to use. We also like the compact size, which is very important for EDC. The Cryo II is a good option to consider for all users who focus on great value for the money. The tight clip can be made looser so that users do not rip their fingernails off during deployment. The Aegis Knife is a great looking folding knife that comes with an ergonomically contoured handle that is very well-balanced, making it comfortable to use. It is also lightweight and compact, making it incredibly easy to carry around. The Aegis showcases opt-end opening, locking technology and partly serrated edge on the AUS-8 steel blade. This is an easy-to-use EDC knife that is tough and can stand up to heavy-duty tasks. The blade also has a black TiNi finish which offers improved durability and an anti-reflective feature. We praise the Aegis Knife for its high quality and cool design. We like its versatility and how comfortable to carry and use is. The partly serrated edge is a feature that we love as it allows the user to perform various tasks with ease. We really like the fact that it is easy and quick to open and also the size which we think is perfect for an EDC, as well as its durability. Our conclusion for this knife is that the Aegis meets all our expectations ticking all the boxes in our list of features to look for in a great pocket knife. If you’re looking for a very dependable knife to carry with you at all times, give the SOG Aegis a consideration. While the blade is sharp and the grip excellent, the construction can be improved to ensure a more flawless performance. We really like the versatility of the Trident Knife. The design and its quality are great, which makes it highly durable. It is light but sturdy, making it handy for all types of cutting tasks, including heavy duty ones. Users say that the best part of the knife, besides its lock, is the clip, which is at the very end of the handle. We like the fact that it is easy to carry discreetly too. The locking mechanism is easy to use, very secure and the SOG Assisted Opening is fast and smooth. Overall the Trident is an outstanding knife and a really good option for EDC. It may be a fantastic idea to give the blade a better edge. There are many scenarios where you need a wonderful sharpened knife. Some tasks take place every day, like opening letters, packages, or zip cords. Other situations come less frequently, such as cutting an animal free from a wire tangle. These scenarios when you least expect them, which is why carrying a pocket knife at all times can really come through in the clutch. Any cutting task becomes quick and easy when you have a knife in your pocket. You may have to cut yourself out a seatbelt one day as well. If you had to limit yourself to just one handheld too, there is no doubt that it would be a knife. The list of things you can do with a knife is endless. You can remove a nail, score wood, punch a hole in your belt (as just mentioned), and so on. It can also work really well as an all-purpose screwdriver, especially for those small screws that are so terribly difficult to tighten. When you have a pocket knife with you at all times, you can immediately, easily and singlehandedly handle virtually any task. 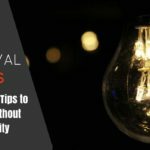 Lighting a fire is one of those skills that you really do not think you need to have – until the day comes that you do. If you are in a situation where you need to start a fire and do not have much equipment, a knife can make a world of difference. You can use it to shave off the bark of a tree to use for kindling, to cut wet wood away or even light a small spark if there is no other alternative. Such scenarios will obviously not arise when you are riding the subway but during intemperate weather or if you are in a rural area, then the ability to start a fire ready to go in your pocket is a quite a good thing to have. Whether you are out on a weekend road trip or out for a walk, you are often short on tools when you are on the move. Luckily, you can make multiple uses of your pocket knife. Cheese, apples, and charcuterie become much more enjoyable and easier to eat when you have a pocket knife handy, and a utility tool also makes it easier to open beer bottles, canned goods, and wine. As valuable as a first aid kit is, you do not always have medical supplies on hand. It is also hard to have enough time to retrieve one in an emergency. A knife is versatile, making it the perfect problem solver. You can use it to remedy minor injuries – such as a splinter or a hangnail. It can also help in tackling more dire scenarios, from making splints or a bandage to cutting a seatbelt to free a driver in an accident. Before anything though, remember to sterilize the blade with rubbing alcohol or a flame before you touch an open wound with it. Portability – When you carry an item around every day, you do not want anything bulky, inconvenient, or uncomfortable. You need something lightweight and compact. When it comes to your pocket knife, you want something that is lightweight and compact. A pocket knife is the best choice for EDC as it is portable. You can slip it into your pocket and carry it around discreetly without having to worry about prying eyes. If you want to carry a knife on a daily basis, make sure that you choose a pocket knife. It is the best choice you will ever make. Practicality – If you are going to carry a knife with you every day, you need something that is practical. It should be able to perform all kinds of tasks – from cutting packages open to outdoor tasks like cutting kindling for a fire. Many people often choose knives based on the looks which is a huge mistake. You need to look at the knife’s practicality as you will be using it for a number of jobs. You need to make sure that it can actually be used when the time comes instead of just looking good when you want to show it off to your friends. Size and Weight – When you are choosing a pocket knife, you need to make sure that it is small and tight. Pocket knives are more about practicality rather than performance. You need to make sure that it is compact enough to carry in your pocket discreetly. It should also be light enough that it is comfortable to carry every day in your pocket. A 3.5-inch blade is best as it is practical and also, it is not considered a weapon in most states. A 4-inch blade is also convenient since it is small enough to be mobile but large enough to perform a variety of tasks. 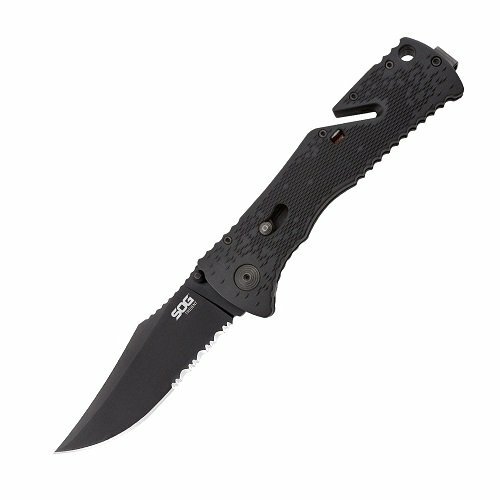 SteelS30V – The S30V is currently one of the most-used, premium steels among knife manufacturers. It is a martensitic powder-made stainless steel. It is considered the best as it keeps an edge, resists corrosion, and is durable. 154CM – This is a relatively hard steel that retains high levels of corrosion resistance, making it a salient material for EDC blades. It is tough enough for a number of uses and is quite durable. It holds an edge well. You will find EDC knives from leading knife manufacturers using 154CM steel. VG10 – The VG-10 steel is similar to the 154CM but comes with slightly more chromium for increased corrosion resistance. It also contains vanadium, which makes it stronger than other steels. It is hard and easy to sharpen too. AUS8 – This is a steel made in Japan and is another commonly used steel. When it comes to EDC knives. It is tough and has good resistance to corrosion and rust. It is also easy to sharpen and holds its edge well too. 14C28N – This is a stainless steel from Sandvik, the Swedish manufacturer. Nitrogen has been added to it which gives it high corrosion resistance. It can be made extremely sharp, which is always a fantastic thing. When it comes to knives. 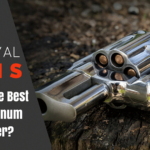 It is one of the best mid-range steels on the market. Handle – When it comes to the handle of an EDC knife, you need to make sure that it is durable. The materials can be metal, natural, or synthetic. Metals are found in titanium, aluminum, and stainless steel. Synthetic handles are found in carbon fiber, Micarta, G-10, a grade of Garolite, and Zytel which is a type of Fiberglass Reinforces Nylon (FRN). Natural handles come in bone, wood, leather, and mother of pearl. The grip is vital when it comes to EDC knife handles. Aluminum and G-10 are the best materials when it comes to providing a fantastic grip. Rubber handles are also magnificent, but they often lack durability. However, every user has a different idea of what feels like a comfortable grip so you will have to choose based on your preference. Partially serrated good to have – A partially serrated edge is a combination of both plain and fully serrated edge types and has become more popular than the fully serrated edge. The combo edge is the ideal choice because you can use part of the knife for rigorous cutting and the other part for push cuts. It combats some of the negatives you get with serrated edges, but you can keep your knife’s sawing ability. 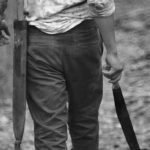 Best blade to have – There are many types of blades to choose from – clip point, drop point, tanto point, straight back, spear point, hawkbill, sheepsfoot, trailing point, wharncliff, spey and needlepoint, to name a few. Each one has its own pros and cons. The clip point is one of the most popular types of blades today. It is prolific for everyday needs, but you can also use it for hunting. It is this versatility that makes it one of the most popular blades today. You can choose the best blade for you depending on the task you have in mind. 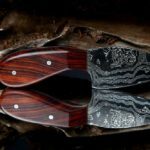 Assisted Opening – The assisted opening mechanism is relatively new to the world of knives, but it has quickly grown to become one of the most popular. When you start opening your knife, this type of mechanism engages and fully opens the knife. Knives that have assisted opening feature a safety lock through which the mechanism is disengaged when the knife is closed. This keeps the blade from opening accidentally. Good Locking Mechanism – A pocket knife lock is a mechanism that helps in keeping the blade open and prevents it from accidentally snapping down onto your fingers. There are different types of locks – liner locks, slip joints, lock backs, mid locks, ring locks, frame locks, and lever locks. Liner locks are the most common types of locks today and are found in most EDC knives. The type of lock you choose for your EDC knife depends on your personal preference. Price – EDC knives come with different price tags. You can choose the right one based on your budget. For most users, a pocket knife priced between $50 and $100 is best. You can find high-quality EDC knives in this price range and receive a solid, reliable, and a durable pocket knife to carry every day. EDC pocket knives are fantastic to own and carry around. They are helpful when you are roughing it out in the great outdoors, or need to get out of a dangerous situation. They are also handy for small tasks like opening packages or letters. Whatever you need one for, having the best EDC knife you can afford is always a prudent idea. There are thousands to choose from and you can be sure that you will find the perfect EDC knife for your needs and budget. Looked like an interesting read but the stupid social media links blocked the text on my iPad. I scrollled down to the bottom to leave feedback and never read your article. thank you for the facts you have shared in here with your article and keep up the good work.